Guba was established in 2009 to explore solutions for an equitable society. Its vision is for all people in Eswatini (Swaziland) to have secure access to nutritious food, clean water, shelter and economic stability through their own energies, utilising solutions that nurture their physical and social environments. Guba focuses on abundant food systems, social innovation, supporting local entrepreneurship, transformative learning and appropriate technologies. 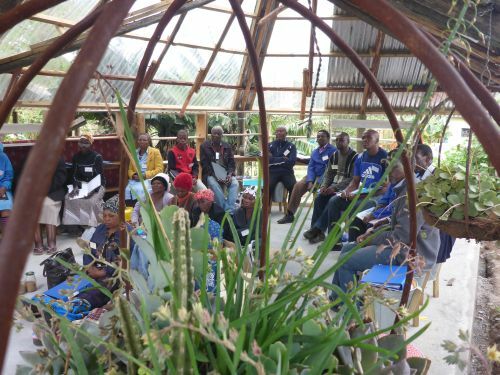 As a permaculture training centre, Guba offers education programmes for children, youth and adults on homestead agriculture, food security, ecological capacity building and income generation, with a view to promoting increased resilience and wellbeing. The Guba Farm Playschool delivers inspiring, holistic learning and guidance to a diverse community of children. Guba operates from a small permaculture farm that demonstrates earth and timber building, combined with off-grid solar energy and water harvesting systems. Guba runs monthly farm tours and regularly host visits from surrounding primary and secondary schools. Through food, art, culture and nature, Guba offers a community connectedness that is both clear and enriching. جائزة لاش ربيع2018. جميع8الحقوق محفوظة. صورة الصورة الرئيسية: Siliman Musse, an activist of Diritti a Sud. Photo by Allessandro Robolino.